Illegal transfer, conversion, concealment of location or assistance in the above act of properties acquired or earned directly or indirectly through legal or illegal means. One of the best methods of preventing and deterring money laundering is a sound knowledge of a customer’s business and pattern of financial transactions and commitments. The adoption procedure “Know your customer” is not only a principle of good business but it is an essential tool to avoid involvement in money laundering. Institutions and intermediaries must keep transaction records that are comprehensive enough to establish audit trail. Such records can also provide useful information on the people and organizations involving the laundering schemes. It is an offense for banks, Financial Institution and other institutions engaged in financial activities not to retain identification and transaction record of their customers. It is an offense for banks, Financial Institutions and other institutions engaged in financial activities not to report the knowledge or suspicion of money laundering to Bangladesh Bank as soon as it is reasonably practicable after the information came to light. The offense of obstructing investigations or failure to assist any inquiry officer in connection with an investigation into money laundering is punishable by minimum imprisonment for one year or a fine of at least Tk.10,000/-, or both. If, any bank, financial institution and the institutions engaged in financial activities fail to retain customer identification and transaction records or fail to furnish required information as per the Act. Bangladesh bank will report such failure to the licensing authority of the defaulting instruction so that the concerned authority can take proper action for such negligence and failure. Bangladesh Bank is empowered to impose fines of not less than Tk.10,000/- and not more than Tk.100,000/- on any Bank, financial institutions and other institutions engaged in financial activities for the4 failure or negligence to retain customers identification and transaction records or fail to furnish required information to Bangladesh bank. Where staff continue to encounter suspicious activities on an account , which they have previously reported to AMLCO/BMLCO , they should continue to make report whenever a further suspicious transaction occurs. All report of suspicious activity must reach the CAMLCO and only he CAMLCO should have the authority to determine whether a disclosure in accordance with the regulation is appropriate. As a type of transactions that may be used by money launderer are almost unlimited, it is difficult to define a suspicious transaction. Suspicion is personal and subjective and falls far short of proof based on firm evidence. It is more than the absence of certainty that some one is innocent. A person would not be expected to know the exact nature of the criminal offence or that the particular funds were definitely those arising from the crime. However a suspicious transaction will often be one that is inconsistent with a customer’s known, legitimate business or personal activities or with the normal business for that type of customer. Therefore , the first key to recognition is knowing enough about customer’s business to recognize that a transaction or series of transactions, is unusual. There is a statutory obligation on all staff to report suspicions of money laundering. Reporting should be made in accordance with the internal reporting procedure to be established by the financial institution for the purposes of facilitating the operation of the reporting obligation. That each relevant employee knows to which person he or she should report suspicions. That there is a clear reporting chain under which those suspicions will be passed without delay to the CAMLCO. Once employee have reported their suspicions to the appropriate person in accordance with an established internal reporting procedure they have fully satisfied the statutory obligation. Internal reporting procedures and Records of suspicions. Reporting lines should be as short as possible, with the minimum number of people between the person with the suspicion and the CAMLCO. This ensures speed, confidentially and accessibility to the CAMLCO. However in the line of accepted practice , some financial sector business may choose to require that such unusual or suspicious transaction be drawn initially to the attention of supervisory management to ensure that there are no known facts that will negate the suspicion before further reporting to the CAMLCO. Record of suspicions, which were raised internally with the CAMLCO but not disclosed to Bangladesh Bank , should be retained for five years from the date of transaction. Record of suspicions which Bangladesh Bank has no interest should be retained for a similar period. Record of suspicions that assist with investigations should be retained until the financial institutions informed by the Bangladesh bank that they are no longer needed. 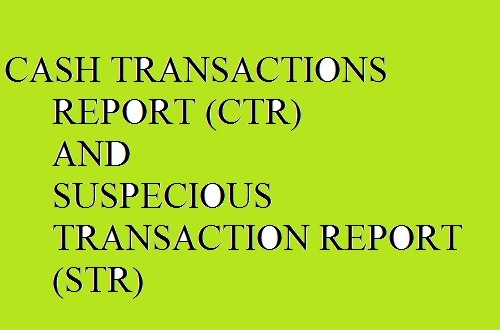 The use of standard format in the reporting of specious activities is important and all institutions are required to use the unusual/ suspicious transactions reporting forms. Sufficient information should be disclosed on the suspicious transaction, including the reason for suspicion, to enable the investigating officer to conduct appropriate enquiries. If a particular offence is suspected, this should be stated so that the report may be passed to the appropriate investigation team with minimum of delay. However, it is not necessary to complete all sections of the specious report form and its submission should not be delayed if particular details are not available. To provide relevant employees with training in the recognition and handling of suspicious transactions. As types of transactions that may be used by money launderer are almost unlimited, it is difficult to define a suspicious transaction. However a suspicious transaction will often be one that is in consistent with a customer’s known, legitimate business or personal activities or with the normal business for that type of customer. Financial Institution must established internal procedures so that, in the event of a suspicious activity being discovered, all staff is aware of the reporting chain and the procedures to follow.